Loading a container on the train for China. Half a mile of steel grinds into Duisburg. The train has 47 containers on board, many with Chinese writing on the sides. You may not have heard of Duisburg, just down the Rhine River from Dusseldorf, but it’s one of the biggest inland ports in the world. This train’s come over 7,000 miles, through steppe and desert and forest, from another place you may not have heard of — Chongqing. This city in the middle of China has about the same population as New York. Between the two — a rail freight route that opened up five years ago to bring high-value IT products like smartphone components and printers to Europe. Over that period, trade has increased more than thirtyfold along what is often called the New Silk Road. To visit the vast Duisburg Intermodal Terminal, the principal European terminus of the New Silk Road, is to get a glimpse into the workings of the new world economy. 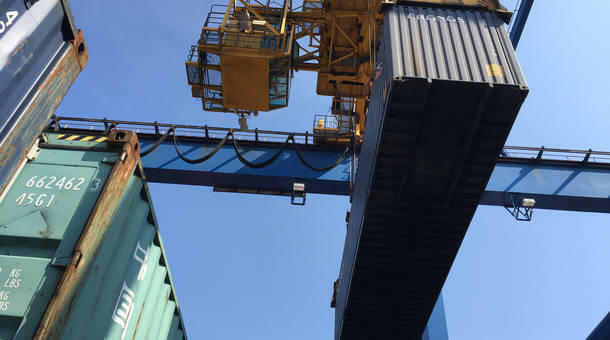 "We are loading the train that will leave in the night for Wuhan," said DIT deputy manager Martin Koerner as a gigantic bridge-crane mounted on rails swings 40-foot containers onto the train. "Each week [we have] nine to 12 trains arriving from China at DIT Duisburg," Koerner said. Eight years ago a delegation went from Chongqing to California. They told printer-maker Hewlett Packard and others they could make their stuff cheaper. Soon after, new factories opened in Chongqing. Now, one in four of the world’s laptop computers is made in that city. The New Silk Road is how these goods reach China’s biggest trading partner — the European Union. "We’re cheaper than air freight, faster than sea freight," said Nicolai Noeckler, the man in charge of developing the New Silk Road for a subsidiary of German railways called Trans Eurasia Logistics. His sales pitch: 15 days transit time instead of 35 by sea. "For customers it’s very interesting because they can sell their goods way faster so they can react way faster on a shortage of goods they have in Europe, and they can also decrease the cost when it comes to warehousing," Noeckler said. How many of those containers go back to China empty? Noeckler said they’ve made progress on that: "it’s now only one in five." The rest are full of car and aircraft parts, food and drink – powdered baby’s milk, for example, and beer.